When you’ve arrived in Fairbanks, Alaska in January and your host asks if you would like to spend the night at Borealis Basecamp, you say yes…even before you know what that means. And then you look it up and realize you’re not just heading to a destination, you’re heading straight into an experience—one that you’ll never forget. 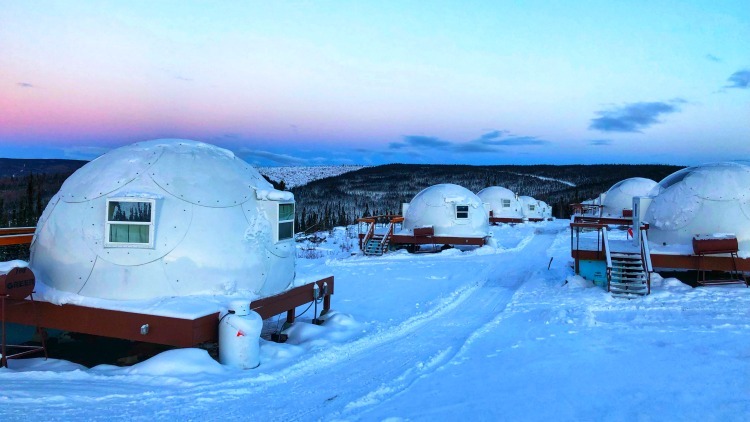 Situated on 100 acres in the snowy boreal forest just 25 miles outside of Fairbanks, Borealis Basecamp feels as if it’s worlds away from civilization—in a good way. 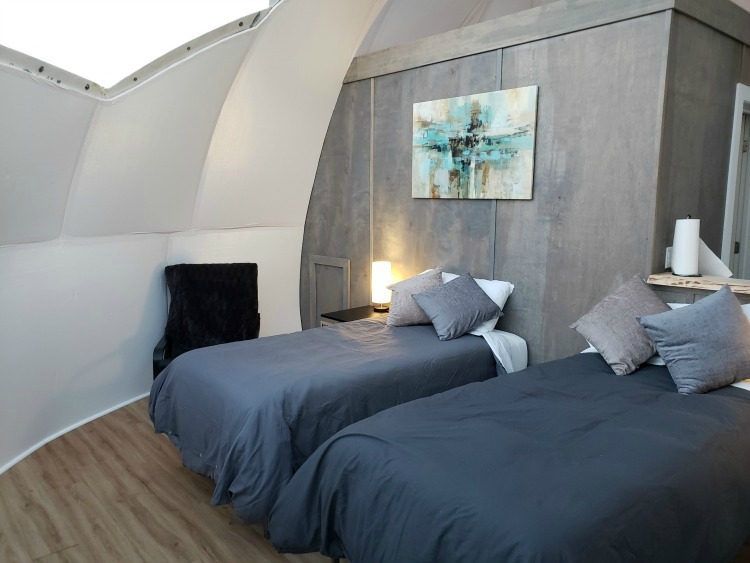 Guests stay in geodesic domes with expansive clear ceilings that provide unobstructed views of the night sky and if you’re lucky, the Northern Lights. And you can see all of this without ever leaving the comfort of your warm and cozy bed. Considering that the temperatures in the region can dip as low as -35 or more, the ‘not leaving the warm bed part’ of this equation is especially enticing. 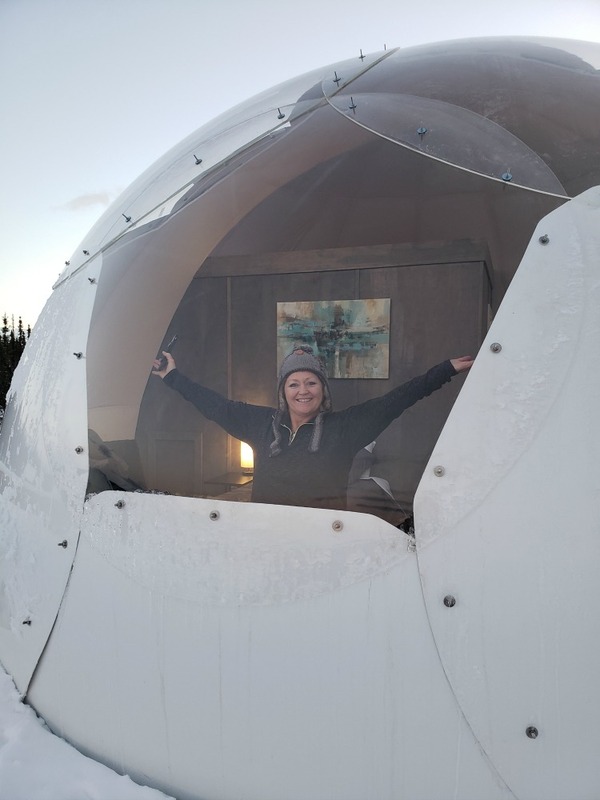 And we were lucky enough to snag a typically sold out dome—which pretty much looks like an igloo or a pod…or maybe an egg. Borealis Basecamp a/k/a the Moon! As we headed out on the ice-covered Elliot Highway and climbed up the mountain—Vanessa’s teeth gritting the whole way and me just admiring the scenery—the snow clouds we’d been under all day began to clear. Our chances for seeing the aurora borealis were improving. YAY! Along with those vast blue skies came a spectacular sunset that warranted a stop for photos. We were snapping pictures like mad when we arrived at the property, which resembles nothing so much as a compound on the moon with pods dotting the monochromatic, snow-covered landscape. We were greeted by Drew, the head of maintenance, who had an abundance of tips to help us capture the aurora by cell phone…well, some cell phones. Drew: Are you planning to take photos of the aurora? Vanessa: But we don’t have a clue how. Drew: What are you using? Vanessa: I’ve got a Samsung cell phone. A Galaxy 9. Drew: Excellent! I can show you a few tricks. Terri: I’m planning to use my cell phone, too. It’s an iPhone. Turns out that iPhones can’t capture the aurora (thanks, Apple!) so I spent the next few minutes listening to Drew explain to Vanessa how to set up the Pro setting on her phone. Seeing as how Vanessa is COMPLETELY technologically challenged, I had my doubts. Yet, she eagerly listed to Drew’s advice, even following him into a dark bathroom to test out the settings. She was quite excited by whatever she was seeing in there, leading some other visitors in the lobby to look questioningly at the sounds coming from behind the closed door. Ah, the lengths we go to for our art. Photography lesson concluded, our lovely hostess Rachel led us to our dome. Inside we found wood floors, stylish furnishings and a cozy, warm atmosphere. If this is off-grid living, sign me up! She showed us how to adjust the Toyo heater and then suggested that we follow her into the bathroom. We were starting to wonder if this was a thing here since this was the second shared bathroom request in less than an hour, but who are we to question the locals? The three of us stood in the bathroom looking down at the closed toilet. Rachel: So I need to explain the toilet to you. Terri (looking at Vanessa worriedly): Um, okay. You know we’ve used a toilet before, right? Rachel: This is a dry toilet. It’s environmentally friendly and very important when you’re living off-grid. Then she opened the lid. We both stood there in amazement—our toilet was filled with aluminum foil. Then she flushed it. Vanessa: What the fresh hell? That looks like Jiffy Pop! Rachel: Well, it kinda does. But I wish you hadn’t said that out loud. Terri (sighs): No more Jiffy Pop in our future. I realize that we’re starting to sound like toilet freaks at this point. But seriously, just watch the toilet flush video (yes, of course, we stood there and took one) and you’ll understand why it’s so fascinating. Rachel: Just one more thing. The foil lining is actually a cartridge, and there are about 12 in each set. When you see the line at the bottom of the toilet, call me, and I’ll come replace it for you. I’m here until about 2 a.m. So now we’ve got a quandary. Have you ever tried to keep track of your flushes? Yeah, me neither. And I have to admit, it’s a little stressful. Even if you don’t have to go to the bathroom, you suddenly do when someone tells you that you have a limited number of chances…and leaves you wondering at 3 a.m. if you should spin that roulette wheel and use the bathroom, possibly leaving your roommate with no facilities, or hold it until you explode. The struggle is real. Anyway, we finally pulled ourselves away from the toilet to go take photos of the lunar-like landscape, and then headed to the dining room for a delicious three-course, chef-prepared meal that included the choice of flat iron steak, Alaska sockeye salmon or Alaskan king crab as entrée options—no complaints here! 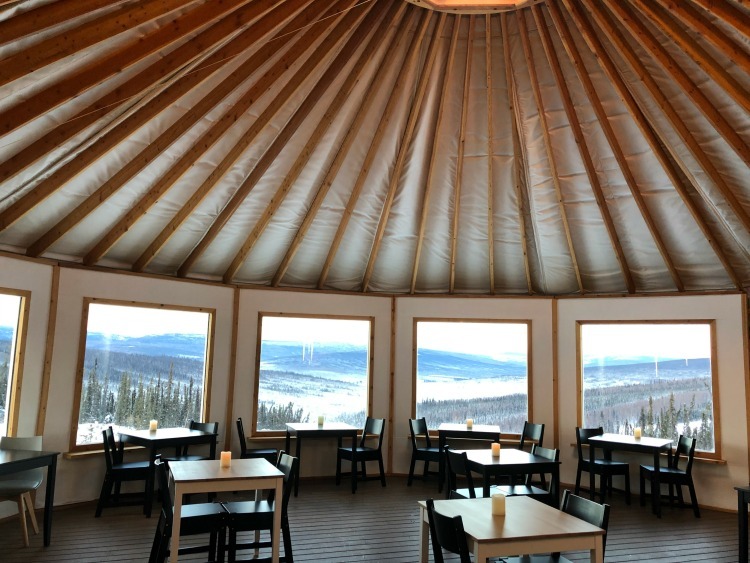 Housed in a large yurt with floor-to-ceiling windows, the dining room was just as impressive as our dome/igloo/egg. There was also a lounge area with a fireplace and comfy sofas where guests could hang out and play games, read and use toilets that flushed without the benefit of Jiffy Pop linings. That evening, we stretched out in our warm beds and looked up at the sky above us. The stars did not disappoint. The Big Dipper was center stage from our beds, and we watched numerous shooting stars in a sky that seemed to go on forever. We anxiously awaited the aurora borealis—and at one point, it started to rise. Terri: This view might even surpass the toilet. Vanessa: Unless you take into account that we may be eaten by a massive hawk because we’re sitting in an egg. Terri: Hopefully, hawks don’t hunt at night. Vanessa: Or an alien might beam us up. We are sleeping in a pod. Terri: Please tell me that you’ll be asleep soon. 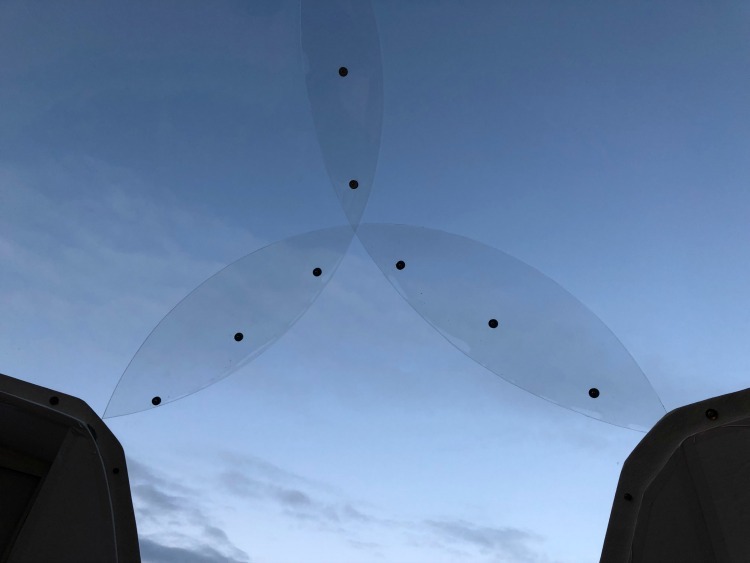 Skyview from our Beds–waiting for nightfall! Rachel: Hi, Terri! The aurora is starting! I hang up the phone and have no idea who that was or where I am. I mean, it’s not your typical hotel room since you open your eyes to look straight up into the sky. Terri: Because I’m in an egg in Alaska. Waking up at 2 a.m. to see the sky change color. Because that makes perfect sense, right? Vanessa: Some people are just not morning people. We watched, waited and eventually began to see a little bit of light rising above the horizon. Vanessa ran outside numerous times to try to get photos, only once making the mistake of going out in her long underwear without remembering to put on pants. Alas, a brilliant aurora wasn’t in the stars for us that night. (See what I did there? ) However, we did spend a night sleeping under the stars, in a dome/igloo/egg-pod, possibly on the moon with a dry flush toilet that still had cartridges available for use. It really doesn’t get any better than that. Reserve early because the Borealis Basecamp has approximately 95 percent occupancy during aurora season from August 21st through April 21st. In addition to viewing the night sky, other activities are available that include sled dog rides, snow machining and walking tours.